If I were to sell tomatoes it would be almost exclusively smaller tomatoes. I would also have yellow and red pear in the mix. For some odd reason every one I know loves these tasteless things. I think I'm going to drop the Sungold for next year so I can call it an heirloom/OP mix. Another tough call is Black Cherry, which I like, but I like Purple Bumble Bee better. Maybe I will try Chocolate Cherry in place of Black Cherry next year. I grew Ambrosia Gold in place of Sungold. The first plant did not produce as well for me as Sungold, but I have not lost any to splitting. However, I found another plant that I had lost track of in the corner of the garden. It is performing much better. It is later maturing than Sungold (for me), but much easier to harvest when I factor in all variables. I did not have much success with Chocolate Cherry. Tried it 2 years in a row and both times it when down to disease early. Perhaps others have better success. I bet you cant grow enough of those cherries to satisfy the people, your color mix looked really awesome. People just love the colors and the different types, the cherries usually hook them, and then they try other stuff too. Nice! At the peak this Summer, we were picking 40 lbs of cherries a day and I sold every last one of them. I had no intention of growing anything near this volume, it just happened . I had no prior marketing plan for this volume. However, all I had to do was show a box to someone and it was purchased EVERY TIME. Then the volume would increase with every order. 40lbs at $4/lb is $160 per daily harvest requiring 2 hours of labor. It is worth it to me at this rate. I lose all my Chocolate Cherries in Atlanta, too, Bill. I have debated going all of cherries with only a few hybrids like big beef and better boy to go with them but then I wonder whether I should try to grow only colorful heirlooms/cherries and try to make that my niche. Most other growers at my market have little selection and grow mostly Mountain varieties. I guess ultimately it will come down to trial and error but I would much rather grow some nice heirlooms than the same meh tasting tomatoes as everyone else. I have determined that being "just another tomato guy" at the market is futile. If you sell what everyone else sells you have no advantage. Last year I sold a few hybrid varieties as well as dozens of OP and heirloom varieties of all sizes. Next year I am not going to offer any hybrids. There are way too many vendors selling them to make them worthwhile for the time, effort and space they take up. 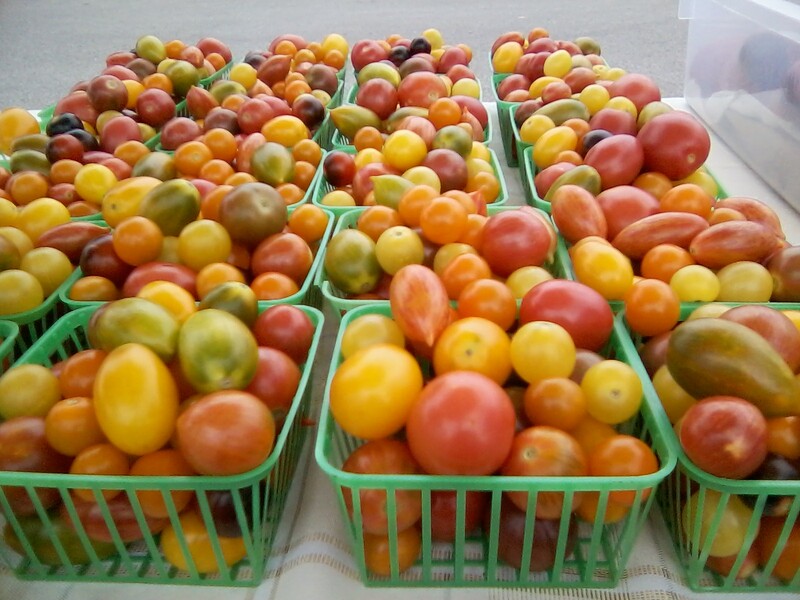 Last year I offered over 50 varieties of cherry tomatoes and dozens of varieties of OP and heirlooms. I offered people the option of "make your own basket" where I let them fill a pint basket as full as they could with whatever they wanted, and I have begun to develop this as my niche. I am getting known for it. Other vendors marvel at the range of varieties I offer...albeit not much quantity of any variety. Next year I'm not even going to offer many classic heirlooms because many vendors are picking up on them. Now everybody sells Cherokee Purple, Brandywine and some yellows/oranges and blacks, etc. Next year I'm going with mostly Amazing Tomatoes that really do amaze customers. These include most of Wild Boar, J & L Gardens, Tom Wagner, Fred Hempel types. So far I have over 170 varieties planned. I put out a couple of each variety in those plastic clam shells (n the open position to make 24 cups) made for apples and refill them as they are sold. It makes the presentation look amazing. Offering samples warms up the buyers. I now have several very faithful customers who don't miss a single market. I have 8 of the clam shells that hold 24 each, and I have very few duplicated varieties. I'm psyched for next season! Yeah I have an aversion to growing things I don't like to eat. I like your idea of letting customers mix their own baskets. How much do you charge for them? 170 varieties! Wow that is a lot of maters! I'm limited to one half of an acre to grow on so I have to be very selective of the varieties I grow. At the moment I'm planning to grow around 120 tomato plants total and around 60 of those plants will be the artisan variety from Johnny's. The rest have turned out to be very hard to narrow down considering things like beauty of the tomato, production, taste, and rarity. The only thing that really concerns me about my specific market is that the population here is a blend of the older generation and college age students, and as you could expect their wants vary greatly. Most older people want a red tomato that they have heard of like Rutgers and the younger generation prefer colorful heirloom varieties and seem to be much more willing to try new things. Luckily we do have a mobile market that just recently started going around to local colleges which I think will greatly improve to demand for colorful heirlooms. Thanks for your post, it makes me a little less trepidacious in going full heirloom/cherry. I charge $5 per pint basket, but I encourage customers to really load them up. I charge $4 per lb for non-basket purchases, so I make sure the basket buyers get more than 1 lb in their baskets to make it a good deal. I even show them how to load the baskets to maximize their tomatoes (small tomatoes on bottom and bigger on top). I'd rather sell out and have pleased customers than go home with unsold tomatoes because I was a chincy. I would also like to comment on converting from hybrids to all OP/heirlooms regarding the acceptability to customers. I have a market population similar to yours. I'm close to the University of NM, but in an older neighborhood so I get all ranges of customers. Some will never accept anything but round, red tomatoes. I've tried to sell other varieties to these types but most are a bit arrogant about what a tomato should be so I just let them stay in their rut. 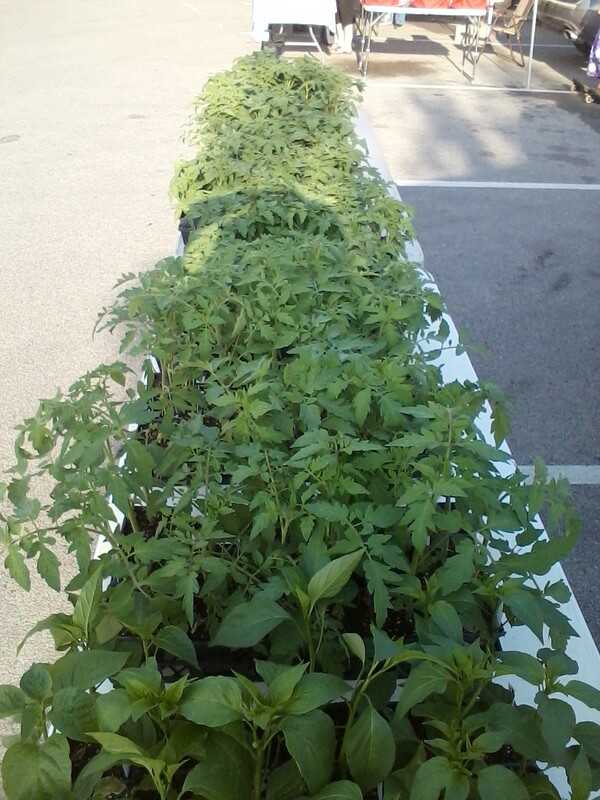 I am very proud of what I sell so even though I am not a salesman by nature I have no problem talking up my tomatoes. I find it amazing how you can manipulate people to some degree if you are authoritative and know what you're talking about. So, in my view, to get people to convert to amazing tomatoes it helps to "guide" them that way and offer samples. I have also discovered that the better groomed I am at the market the more people are comfortable with me. I used to come straight from the tomato patch from picking and I would be a bit...how you say...sweaty. I now make sure I have time to clean up so the peeps are more comfortable. My daughter-in-laws helps me sell sometimes and I find it amazing how a good looking girl attracts customers too! Unique, Unusual, and Unorthodox sells tomatoes. It helps if they taste really good. I would grow Sakura Honey if I were selling at a market. Thanks for the info Charley, I pretty much talk about tomatoes all the time (just ask my fiance) so I will certainly be trying to convince people that my tomatoes are too tasty to pass up. Fusion that was yet another tomato I had never heard of. After a little research it looks great and I will probably put it on the list. The problem is my list is wayyyyy too long and my property way to small. Definitely going grow the Japanese black truffle, it's got to be one of the prettiest tomatoes I've ever seen. I'm going to grow almost all cherry tomatoes in the outdoor garden next year. They were a big hit last summer. I'm thinking I'll have three different mixes. I ordered the variety pack of the Artisan Cherries; that will be one mix. I can make another mix out of all the heirloom varieties I have. The third cherry mix will be hybrids. I ordered Sungold, Sun Lemon, Sun Chocola, and Sun Peach. I'm going to call them "The Sun Sisters." Cole_Robbie, just found this thread. We moved from So Cal to So Oregon a year ago. I am involved in a large farmers' market group here. Last summer, I was dismayed to see tomatoes going from $1.50/lb (hybrids) up to $2.50/lb and people STILL complained that they were too expensive. I thought those prices were cheap! I wasn't planning on growing toms for market but maybe a nice colorful cherry tomato asst like you are doing would be nice. There was at least one booth selling them but not a wide asst of colors. Btw, I was pleasantly surprised to see that Cherokee Purple was the main tomato offered by several farmers. Lots and lots of CPs and they were a good size too. Where did you order the Artisan Cherries variety pack from? I just saw, you ordered them from Johnny's. I brought 180 plants, and I took home 18. It was a good day. Seven of my ten flats were dwarfs.